Singapore, 7 January 2019 – Since the early 1930s, New York City has been the epicentre of jazz, the venue of legends and aspiring talents, the epitome of swing, stride or bebop sound. From the conspicuous musical theatres on Broadway or the late-night clubs of Harlem, to speakeasies or subway stations, this heady metropolis has been a place saturated by the unmistakable sound of eclectic tracks and shuffle beats.Inspired by this soundtrack and vibrant energy, Bang & Olufsen is introducing a special edition of Beoplay A1 and Beoplay E8 in stunning Late Night Blue, a colour inspired by jazz, music clubs, and the flashing neon signs of the backstreets of New York City.With category-breaking performance and a crisp and rich Bang & Olufsen Signature Sound experience despite its small footprint, Beoplay A1 is an ultra-portable Bluetooth speaker ideal for those who care about great design and sound on the go. Delivering up to 24 hours of play time from a single battery charge and featuring calls and voice interaction, Beoplay A1 Late Night Blue comes in a splash and dust-resistant design with authentic, premium materials including anodized aluminium and leather.Ergonomically engineered to fit comfortably into your ears, Beoplay E8 delivers industry-leading sound and a true wireless experience. The earphones are tuned by acclaimed Bang & Olufsen sound engineers for a full-bodied and precise soundstage, and they come in a premium, genuine leather case. The Late Night Blue colour vibrantly highlights the design while underlining the anodized aluminium and leather details. 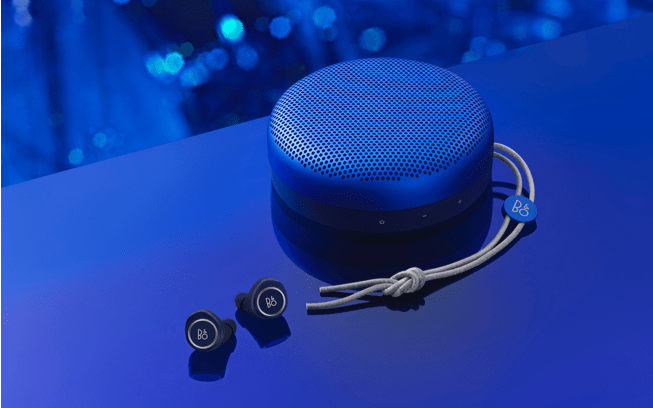 Beoplay E8 and Beoplay A1 Late Night Blue are part of the Special Edition Collection, a wider collection of colour variants, each with its own unique colour concept, and only available in very limited quantities. Beoplay E8 and Beoplay A1 Late Night Blue Special Edition are available at Bang & Olufsen Grand Hyatt, Bang & Olufsen Takashimaya and Bang & Olufsen TANGS, starting January 4, 2019. The Beoplay E8 earphones come with a premium leather charging case, five eartips and a charging cable. Beoplay E8 Late Night Blue retails for SGD 460, while Beoplay A1 Late Night Blue retails for SGD 400. The rich heritage built around the relentless determination to create products that push the boundaries of audio technology continues to place the company at the forefront of audio innovation. Today, every Bang & Olufsen product is still characterized by the unique combination of beautiful sound, timeless design, and unrivalled craftsmanship. The company’s innovative and progressive audio products are sold worldwide in Bang & Olufsen monobrand stores, online, and in multibrand stores. The company employs over 1,000 people and operates in more than 70 markets. Bang & Olufsen’s shares are listed on NASDAQ Copenhagen A/S.